One of the most prestigious art awards in the heart of Milano. Artist Marija Tanaskovic Papadopoulos is among the selected artists who won this award. Milan, Clerici Palace. 21 April, 17,00. Hours over two hundred international artists rewarded. Organization Effeto Arte. Curated by Sandro Serradifalco. With the accusation: The Art Critic Serena Pug, the art consultant dr editorial. Rino Lucia, the art consultant Francesco Saverio Russo, the Art Critic Salvatore Russo and the publisher Sandro Serradifalco. Guests of honor of opening day will be the artist Vesna Pavan and José Van Roy Dali, painter and heir of Salvador and Gala. Important celebrities from the world of culture will be present at the ceremony and the talented artists will be awarded with an important prize for their careers. In April 2016 number of the magazine “Art International Contemporary Magazine” will be realized a rich introductive piece dedicated to the Master Giambattista Tiepolo, followed by the publications dedicated to the valid contemporary artists that are selected for the event. The awarding ceremony will occurr with famous personalities of the world of culture present. Moreover an elegnat catalog will be ditributed in Italy to gallerists, collectors, art traders and it also has a multimedia version availble that can be consulted on the web platform “Calameo”. Clerici Palace, in Milan, is considered a kind of Versailles of the city, and it has been buoght by Clerici Family during the second half of VII century. It was beautyfied during the first years of VIII century and became one of the most elegant private mansion of the Hapsburg reign and pride for a Noble descent, that became the predominant one in the international politics field. Today is one of the most amazing place in Milan, and inside it, it is possible to visit what in 1942 became the “Ispi” office (International Politics Studies Institute) and the Tiepolo Gallery. 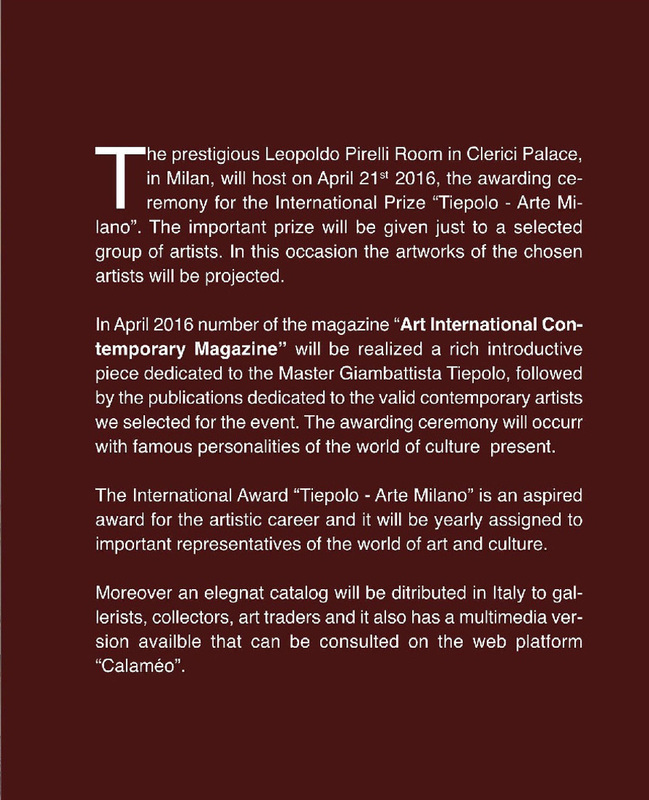 On April 21st 2016, the awarded artists in Pirelli Room, will have the opportunity to visit the Tiepolo Gallery. The prize is given to those artists who has been chosen by Mr. Salvatore Russoand Francesco Saverio Russo.